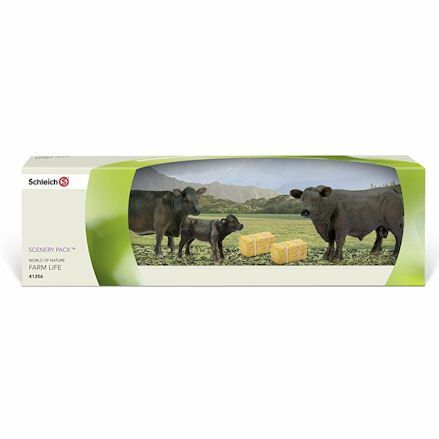 Introduce the toy Aberdeen Angus breed in the home with a replica toy cow for use in the shed or build up a family. Scottish Aberdeen Angus cattle are a beast of an animal, known for their large figure and silky black coat with only their nose standing out amongst the darkness. Aberdeen Angus toys come in all shapes and sizes, whether it's a stand-alone toy bull or family of Angus including a toy cow, bull and calf to complete the set. Although, with Britains you have a useful set of 1:32 scale Angus cattle to create an instant farm scene with a bunch of toy cows. The toy brands below have one thing in common, each toy farm animal is hand painted and made from a sturdy plastic to withstand rough child's play on the farmyard. Collecta's very own version of the Black Angus is a real winner as the sculpture is beautifully made by a very talented person. Collecta currently only have 2 Aberdeen Angus in there range with a black and an identical red Angus bull, both set in a standing position, looking over to his left with his head facing down. Because this figure is all on his own, he can be introduced to all types of cattle breeds but will be most welcome with cows only. 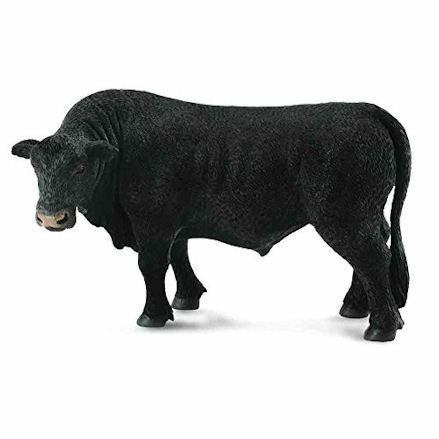 The Collecta Black Angus toy bull features lots of detail on his face, belly and back, with the texture on his body feeling rough but certainly realistic. If you come up a little short on this range, you can match up this bull in the same scale as Safari's own range. Britains farm toys recent addition to their farmyard animal set over the last couple of years saw the introduction of a pack of 4 Aberdeen Angus cattle in all their glory. 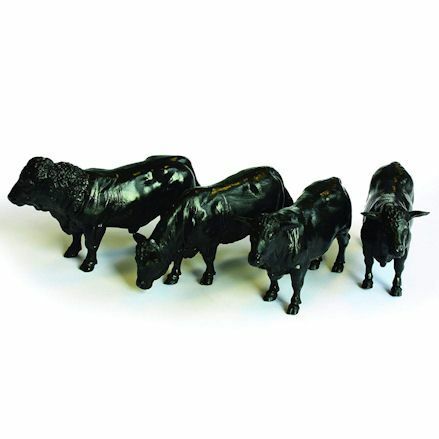 This set of Britains Aberdeen Angus Cattle is made in 1:32 scale and includes three Angus cows and one bull to complete the set. 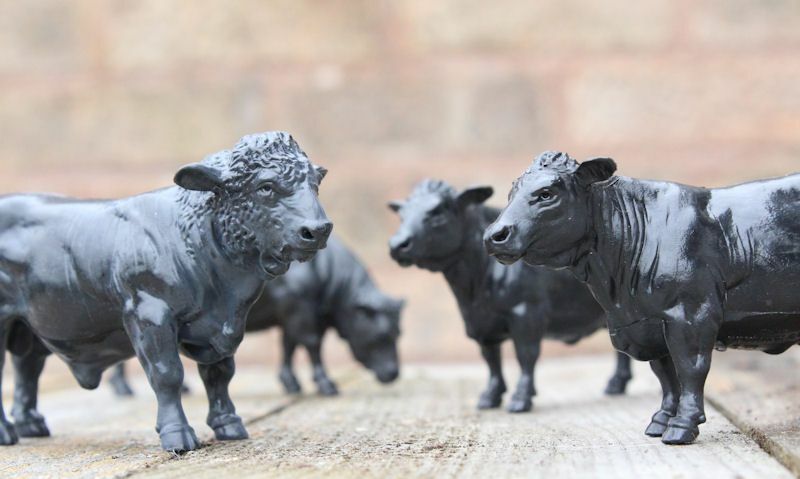 As with all Britains farm animals this set is made from a strong but flexible plastic and made from a black plastic with no hand painting involved, which is a first for Britains farmyard animal range. Get the farmyard scene up and running with this set thrown in right away or use them in the cow shed with related farm accessories available separately. Latest addition of the Schleich Angus family (pictured) box set or you can find the Angus cow, bull and calf available individually. And if you're looking for another Scottish breed, take a look at Schleich Highland cattle family or individual figures. Before the loss of the original model Angus cattle by Schleich, they were probably the most impressive replicas available, and they've done well to replace them here. These models are distinguished nicely with a little red colour in the painting finish which certainly brings out the detail on the body and face. 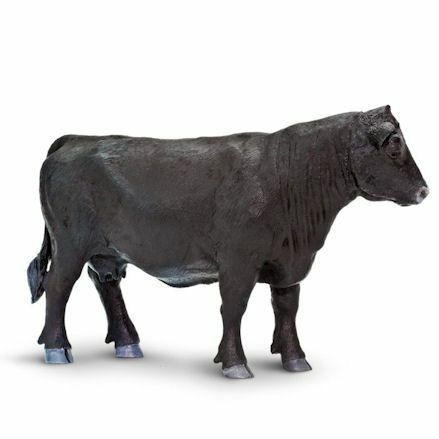 If you are lucky enough to find the Schleich Angus cattle, be sure to buy the bull, cow and calf in the whole family. Safari Limited also have their own Angus cattle, but are not as realistic as their counter-parts, but made with a more playful feel. But as they are made in a similar scale to Collecta's own range, you'll have your options open when you look to expand the range and certain figures don't impress you. The Safari Angus cow (pictured on right) is most notable from her udder beneath her. She's in a standing position looking slightly to the left. Her big hoofs will sure keep in a secure standing position with a smooth finish to the body. Safari Ltd's Aberdeen Angus toy is a little tricky to find on the market but sure do look out for the matching bull and calf.